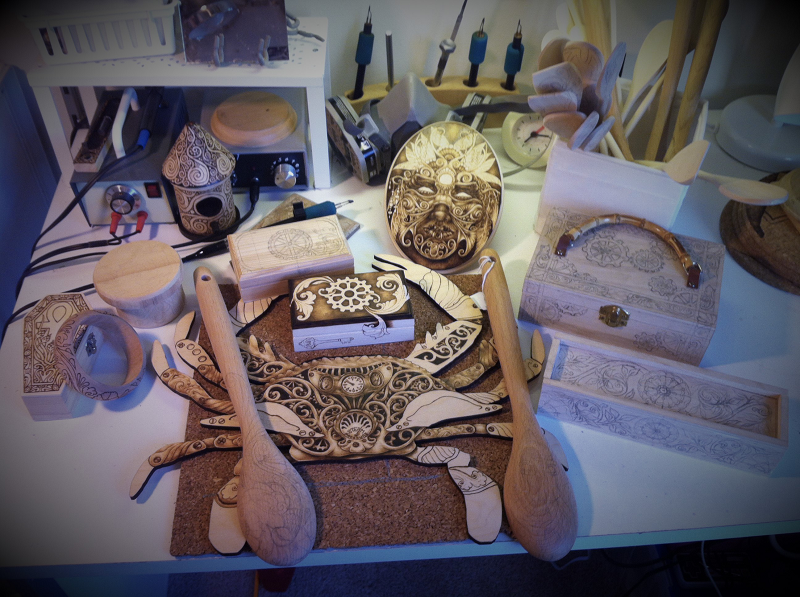 Michelle Greenwood is an artist and vendor from Red Lion, Pa., who curently specializes in pyrography, the Victorian art of woodburning objects with designs. As she puts it, "My education is in Japanese and Creative Writing, but art always has been, and probably always will be, my passion. I also dabble in costuming, pen and ink, and embroidery, but I like pyrography the best. I enjoy pushing the boundaries of what is traditionally considered “pyrographic art,” using the medium to render themes that are unusual for the artform, and constantly testing and improving my skills and techniques. Also, fire." Her works can be found at events such as Wicked Faire, Steampunk World's Fair, and her site, Greenwood Creations. Professionally, I’d describe myself as an “artist who focuses on pyrography, but occasionally dabbles in other media.” I like to play and experiment with art, and right now pyrography is what primarily enchants me. It’s such an under-utilized medium! How I would describe myself personally is another matter, of course. I’d say, privately, I’m a “work in progress.” I want to live a life that fits my principles, and that takes a lot of reimagining, relearning, and self-reflection. All of which, being an impulsive and emotional artsy type, I’m pretty terrible at. So, yes, “work in progress” is a good description! In 1998-99, I saw the trailer for "Wild Wild West." That movie took my love of sci-fi, history, Victoriana and the macabre, and smashed it all together in a glorious, irreverent, mad-science way. It was instant infatuation. Now, I know it’s popular right now to say that movie was horrible, and I can respect that opinion… but I am not ashamed to admit that I still love it. It’s so visually thrilling! My work always starts with three things: A piece of wood, a No. 2 pencil, and a theme. The theme is usually provided by an upcoming show, such as Steampunk World’s Fair, and it’s only one or two words or simple concepts: “Absent-minded inventor,” or “Floral clockwork.” From there, it’s just a matter of doodling—playing around—until a solid idea starts to take shape. If I go into the studio with too rigid a mindset, I find that I get burned out very quickly. In the initial stages, especially, I try to keep things loose and experimental. There’s tons of doodling directly onto the wood before a piece is finished. Crunch time in the studio! This is a tough one to put into words. Human interaction with our planet throughout history? A coming together of the natural world, scientific exploration and discovery, and ideas of our past and our future? “Exploring the intersection of History, Nature, and Human Imagination…” ? I think that’s all accurate… but it’s sort of high-flown and hippy-dippy. Really, I’m just a big cultural history and science nerd, and find a smorgasbord of inspiration there! In addition to a rather daunting custom order list, I’m playing with a series of “mask” portraits, a few airships that are based on eras in British history, and some cigar boxes decorated with literary characters I love. Later this summer, I hope to start working on a set of fan-art panels (NeoVictorian Jem and the Holograms is first on my list!). In the fall, I plan to start two larger gothic panels; one based on Dante’s Inferno with a Danse Macabre feel, and one honoring The Morrígan. Vending at Steampunk World's Fair. Broaden your horizons, younglings! The world is vast and diverse and we here in the U.S. are only exposed to a tiny, biased slice of all of the glorious realities and perspectives that are out there! Remember the “punk” part of Steampunk. Challenge accepted standards. Question “authority.” Don’t conform. Ask the hard questions, and demand complete answers. Stay informed. But always balance that with compassion and respect and dapper dress. Also, read up on world culture and world history, because I guarantee you, you’ll find people and events in history that will make sci-fi and superheroes pale and lifeless in comparison.